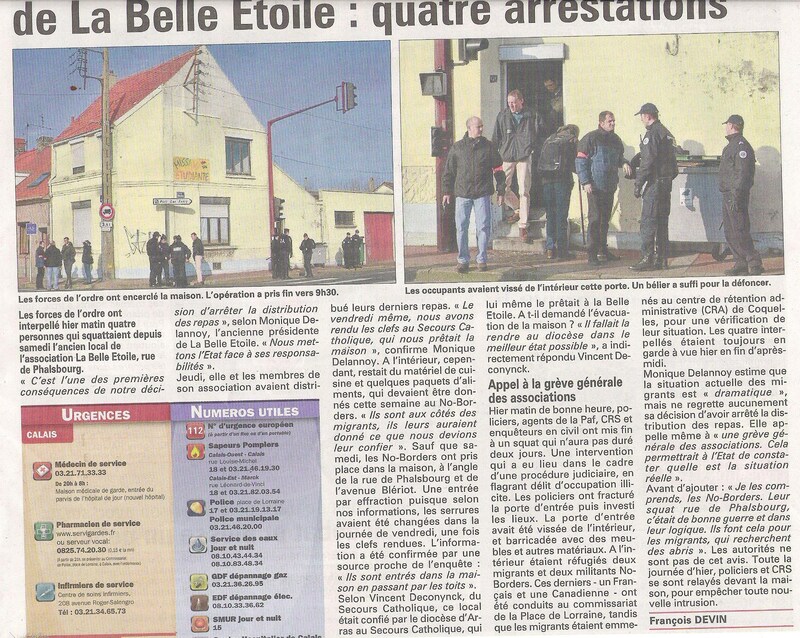 On Friday March 1st after Belle Etoile served their final meal the building which they had been using to prepare the food was occupied by No Borders and people from different communities. This was done in an effort to ensure that the cooking facilities that had been used for feeding Calais’ migrant population for many years would continue to be open and accessible to them in the future. The intention was to open the space and allow the remaining food and gas inside to be distributed and used by the various communities to feed themselves rather than make this the responsibility of some charitable volunteers. The building would also serve as a social center, however, the Dioses of Arras and Secour Catholique were not as enthusiastic as others were with this idea and made a formal complaint to the police regarding the occupation, which resulted in a morning raid the following Monday that delegates of Secours Catholique were on hand to witness. The CRS and PAF entered by force at 8:45 AM arresting the four occupants inside; taking two people (one Afghani and Sudanese) to Coquelle while taking the other two to the Hotel de Police. All four were released later that day with the two people taken to the polcie station being charged with ‘degradation’ and face court in May.